Choose from 77 hotels and guest houses in Lancashire. Shown below a just a selection of the hotels available. To search within an area please use the menu on the right. In 3 acres of gardens, just minutes from junction 19 of the M62 motorway and only 4.5 miles (7.2 km) from Manchester, the hotel offers free Wi-Fi, full English breakfasts and free parking. The Birch Hotel is only minutes from the M60 and 3 miles (5 km) from Bury, Rochdale and Oldham. The double-glazed en suite rooms have radios, hairdryers, telephones, trouser presses and tea/coffee. The hotel's restaurant offers fresh dishes and overlooks the gardens and the fountain. There are 3 bars, 2 function rooms and a comfortable lounge. Guests get free entry to the nearby Esporta Heath Club, which boasts good leisure facilities and a swimming pool. Within easy reach of the M65 and 3 miles (4.8 km) from Blackburn Train Station, Premier Inn Blackburn South is a family-friendly hotel with a Brewers Fayre restaurant and free parking. A retail and leisure park is a 10-minute drive away and has a cinema and bowling alley. 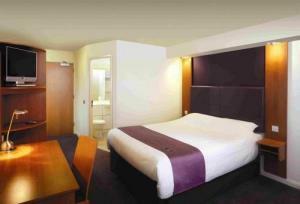 Blackburn South Premier Inn has comfortable rooms, some of which can take 2 adults and up to 2 children (under 16 years). The 2 children also get a free full breakfast when accompanied by an adult eating a full breakfast. The all-you-can-eat breakfast includes typical cooked items including vegetarian sausages. There is also a wide continental selection. With a 3-course breakfast included in the price, the New Central Hotel is in the heart of Blackpool near the Winter Gardens, Blackpool Tower and seafront. New Central Hotel is purpose-built, with families and business guests in mind. Single, double, twin and family rooms are available, all with en suite toilets and showers. A lounge bar stays open till late, with comfortable leather sofas, TV and pool table. Entertainment to suit all ages is often staged here. For breakfast you might choose full English, continental or even scrambled/poached eggs on toast. Evening meals are also available and special dietary needs are catered for. 6-course candlelit dinners are often served on Saturday evenings. Overlooking the seafront on the North Shore, away from the noise of the town centre, this acclaimed hotel offers a leisure club, daily live entertainment and children's activities. A national finalist at the Hotel Club Awards 2007, the Norbreck Castle Hotel provides plenty of entertainment for children and adults alike. The exclusive 36-seater hotel cinema plays a number of children's films and cartoons. The hotel also has a leisure club, with free access to an 18-metre indoor heated swimming pool, a children's splash pool, a sauna, a steam room and a jacuzzi whirlpool. There are also numerous beauty treatments available, as well as a fully equipped gymnasium (at an additional cost). Benefiting from a prominent position on Blackpool's quieter North Shore, the hotel enjoys panoramic sea views, yet is only a short tram ride away from the bustling centre of Blackpool with its many attractions including the tower, piers and Pleasure Beach. 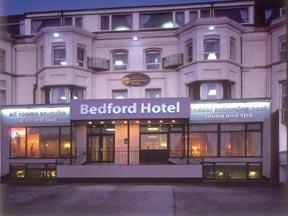 Situated on Blackpool's exclusive North Promenade, the 42 bedroom Bedford is the ideal base for your holiday. 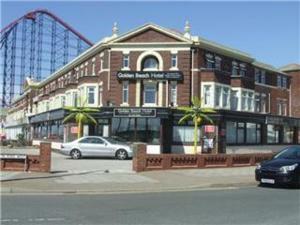 It is a short walk from the town centre, North Pier, Blackpool Tower and within easy reach of the Pleasure Beach. The Bedford hotel has been awarded Quality Plus status. It has been family run for over 50 years, establishing itself as one of the areas best. We have an enviable reputation for 1st class food and service. Sea view rooms, luxury sea view lounge and a well stocked bar with live entertainment throughout the main season are all offered. Whether your visit is for pleasure or business, take a well deserved swim in our indoor heated pool, or sit back and relax in the turbo spa or sauna. Overlooking the picturesque Lancaster Canal, this 19th century mill has been tastefully refurbished to provide modern and comfortable accommodation close to the Trough of Bowl and the small fishing village of Glasson Dock. The Mill Inn at Conder Green provides the ideal base for a wide range of guests, from sailors to bird watchers and tourists to business guests. Children are also well catered for with a designated play area. In the evenings you can enjoy a creative menu which combines good local produce sourced from the fish port of Fleetwood and meat and vegetables from the nearby Cumbrian Lake District. Lancaster Premier Inn will suit all visitors, and is convenient for Lancaster Train Station and Lancaster Business Park. Within easy reach are the M6 and the historic city centre. Besides the comfy beds and free parking, Premier Inn Lancaster has an on-site Brewers Fayre restaurant serving good-value food. Some rooms at Premier Inn can take 2 adults and up to 2 children (under 16 years). The 2 children also get a free full breakfast when accompanied by an adult eating a full breakfast. The full all-you-can-eat breakfast has the expected cooked items, including vegetarian sausages, as well as a wide continental selection. 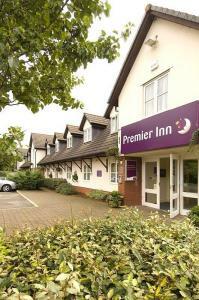 Premier Inn Blackpool East is set in Whitehills Business Park beside junction 4 of the M55. 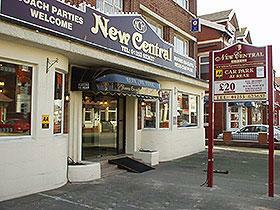 It has free parking and is about 4 miles from Blackpool's popular attractions and town centre. The hotel comes with a family-friendly restaurant that serves good-value meals. Blackpool East Premier Inn has incredibly comfy beds in every room. Some rooms at Premier Inn can take 2 adults and up to 2 children (under 16 years). The 2 children also get a free full breakfast when accompanied by an adult eating a full breakfast. The all-you-can-eat breakfast includes the expected cooked items, including vegetarian sausages. There is also a wide continental selection. A few minutes walk from Blackpool's North Pier, The Claremont hotel is the ideal base for your holiday. Don't forget to ask for your free what's on guide at reception, giving you discounts on many attractions in and around Blackpool. Luxury sea view lounges, a cafe bar, an indoor swimming pool and comfortable bedrooms are just some of the fabulous facilities on offer. The hotel prides itself on great food, home from home comforts and friendly yet professional staff. Whether your visit is for business or pleasure, you are sure to be pleased with the leisure facilities. Take your pick from the 30 metre indoor pool, sit back and relax in the sauna or jacuzzi or even spend time under the warm lights of the sun bed. Wine and dine in the stylish restaurant and then take your seat for fabulous cabaret and dancing until late. This stunning, Grade II listed, 17th-century building is well located in West Lancashire, within minutes of junction 26 of the M6, and close to Wigan and Skelmersdale. Holland Hall Country House Hotel is privately owned and has recently undergone a massive ?2 million redevelopment. Bedrooms, the restaurant, function rooms and lounges have been completely refurbished. The hotel is set in an area of outstanding natural beauty and is surrounded by woodland so you can enjoy excellent views of the adjacent Dean Wood Golf Course and the forest. 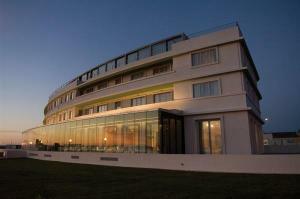 With a perfect seafront location, this Art Deco design hotel boasts free Wi-Fi, a spa and a stylish interior. Morecambe Rail Station is just a 5-minute walk away. Midland Hotel offers sleek, boutique style rooms and ultra-modern en suite bathrooms. Some rooms have striking sea views. Sample excellent modern British cuisine in the hotel restaurant or enjoy a drink in the Rotunda Bar, with idyllic bay views. Relax on the stunning rooftop terrace and unwind with a treatment at the Midland Spa. This traditional 19th century, friendly village inn is situated in the pretty village of Slyne-with-Hest, 2 miles north of the historical city of Lancaster. There is a comfortable, welcoming bar, where you can enjoy a pint of local award winning Jennings Lakeland beer. There is a style of dining to suit your mood, with the informality of the bar area, or the more intimate a la carte restaurant. 10 comfortable, refurbished, en suite bedrooms are located in a converted stable block next to the inn. The inn is not far from the M6 motorway, while Morecambe Bay, the Yorkshire Dales National Park and the Lake District can be reached by car. Just off the M6, this Premier Inn hotel is 8-10 minutes' drive from Preston Golf Club and Deepdale (for Preston North End FC). Lancaster and the Lake District are also within reach. The Premier Inn Preston East has free parking and an on-site Beefeater restaurant, serving fresh char-grilled food. Some rooms can take 2 adults and up to 2 children (under 16 years). The 2 children also get a free full breakfast when accompanied by an adult eating a full breakfast. The full all-you-can-eat breakfast has the expected cooked items, including vegetarian sausages, as well as a wide continental selection. This Premier Inn hotel is close to the M61 and M6 motorways, with 3 golf courses nearby. Enjoy free parking, comfortable en suite rooms and an on-site restaurant. The Premier Inn Chorley South is 1 miles (1.6 km) from central Chorley and its National Rail station. The hotel is a 15-minute drive from Camelot Theme Park. Some rooms can take 2 adults and up to 2 children (under 16 years). The 2 children also get a free full breakfast when accompanied by an adult eating a full breakfast. The full all-you-can-eat breakfast has the expected cooked items, including vegetarian sausages, as well as a wide continental selection. The Pines Hotel was built in 1895 and was originally a private gentleman's residence of Victorian design. Situated in landscaped gardens and mature woodlands, the hotel offers every modern comfort and luxury, yet still retains the ambience of a bygone era.. A truly unique hotel based within easy reach of all major road, motorway, rail and air travel networks. A short walk from the sea, Premier Inn Blackpool Central is near to Pleasure Beach and the Golden Mile. Sleep well on comfy beds and benefit from free parking. The hotel is close to the end of the M55 and 1.5 miles from the airport - ideal for efficient onward journeys. Blackpool football ground is a 10-minute walk away. Some rooms at Premier Inn can take 2 adults and up to 2 children (under 16 years). The 2 children also get a free full breakfast when accompanied by an adult eating a full breakfast. Good-value family dining is available at the on-site Brewers Fayre restaurant. The all-you-can-eat breakfast includes traditional cooked items, including vegetarian sausages. There is also a wide continental selection. This charming, small hotel has a quiet village location and holds 2 AA Rosettes for its home-cooked, good-quality food. The Millstone at Mellor is a highly rated AA 2-star property that is ideal for exploring the Ribble Valley. It has free Wi-Fi, free parking and comfortable, attractive rooms. Breakfast is included in the room rate. Just off the M6/M65, with nearby national rail links, this Premier Inn hotel is very close to Cuerden Hall and Cuerden Valley Park. Enjoy free parking and family-friendly rooms. The Premier Inn Preston (Cuerden Valley) is less than a mile (1.5 km) from Lostock Hall and Bamber Bridge rail stations, with trains to Preston, Blackpool, Blackburn and Burnley. This Premier Inn has an on-site Two For One restaurant, with daily good-value deals. Some rooms can take 2 adults and up to 2 children (under 16 years). The 2 children also get a free full breakfast when accompanied by an adult eating a full breakfast. The full all-you-can-eat breakfast has the expected cooked items, including vegetarian sausages, as well as a wide continental selection. Just minutes away from the world-famous Pleasure Beach, this welcoming hotel is ideally situated on Blackpool's South Promenade, within easy reach of the bustling town centre. Upon your arrival, you will enter into the elegant reception area where a member of the Golden Beach's friendly staff will greet you. Their aim is to ensure that you have a comfortable and relaxing stay, so whatever you need, pleas just ask. Boasting wonderful sea views, the Golden Beach Hotel also provides a fully licensed bar and games room for the kids. Right at Blackpool Airport, this hotel is very convenient for travel connections. Good rooms with comfy beds, an on-site restaurant and free parking made it a welcoming base. Premier Inn Blackpool Airport has a Two For One restaurant for great-value meals in a friendly atmosphere. Some rooms at Premier Inn can take 2 adults and up to 2 children (under 16 years). The 2 children also get a free full breakfast when accompanied by an adult eating a full breakfast. The all-you-can-eat breakfast includes the expected cooked items such as scrambled, fried, poached or boiled eggs, and pork or vegetarian sausages. There is also a wide continental selection. Boutique-style Silver Award accommodation, full of character and surrounded by charming gardens; this Victorian guest house is 2 minutes from the M65 motorway and offers great value. With a convenient location, good access to the region's main roads and a high standard of accommodation, the Norwood makes a great base for your visit to the area. The Norwood recently received a Silver Award from the English Tourist Board for the 3rd year running. All of the comfortable, non-smoking rooms are en suite and well equipped. All rooms have flat-screen TVs, DVD players and tea/coffee. Free wireless internet access is available and there is free parking for guests' use. The Norwood also offers a delicious traditional Lancashire cooked breakfast. Built in 1856, Rosehill House is half a mile south of Burnley town centre. It has retained much of its original architecture and offers free parking and free wireless internet. The hotel is located just off the A682 and is easily accessible via the M66, M62 and M65. It is set in ample grounds and offers a snooker room. All bedrooms have a TV with 14 channels including movies, sport and foreign-language channels. Some bedrooms are specifically designed for business use. Conference rooms are also available.